Effectiveness of pictorial based self-management among adult with asthma in a suburban primary care health clinic: a randomised controlled trial. M R Radzniwan, S Y Chow, A S Shamsul, M F Ali. 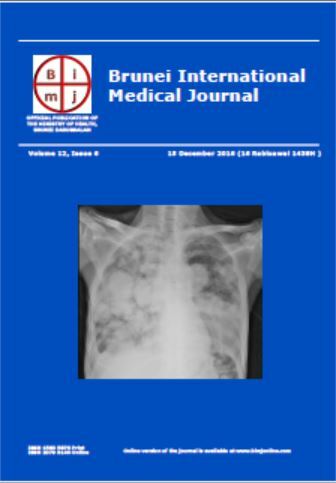 Colonic diverticular disease in Brunei Darussalam. E Ru WONG, Fazean IDRIS, Vui Heng CHONG. Inflammatory myofibroblastic tumour of the paranasal sinuses. Syarifah Nafisah AL-YAHYA, LOO Chun Pin, Thilagam TANGAVELU, Pasupati Meenakshi THANIKACHALAM, Shahizon Azura MOHAMED MUKARI, Salina HUSSEIN. A case of anorexia nervosa with severe bradycardia. Mohd Ridzuan MOHD SAID, Mohd Shawal Faizal MOHAMAD. Muhammad Ilham ABDUL HAFIDZ, Stefanie Kar Yan HUNG.